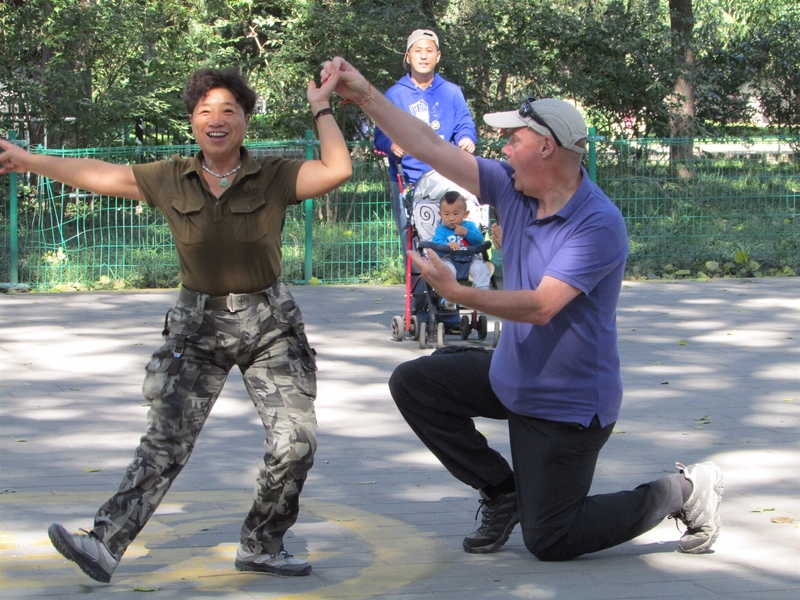 Cracking China Chums | "MASTERS"
Posted on October 17, 2015 by Mark and Sarah - MASTERS! MARK: I’m a shy person. Ok, so that’s a lie (really – Administrator LOL!!!! ), but I do from time to time get nervous when encountering groups of people in a social situation. Professionally no problem, give me a room of 250 strangers and happy days, network city! For the last six weeks it’s just been me and Sarah. Indeed for 7 days we were the only white faces around and conversations, with the exception of Garima my “Indian Sister, were really limited. Surprisingly we are both still getting on, which is not bad, seeing we’ve not left each others sight for more than 5 minutes during that time. It must be love – MADNESS! 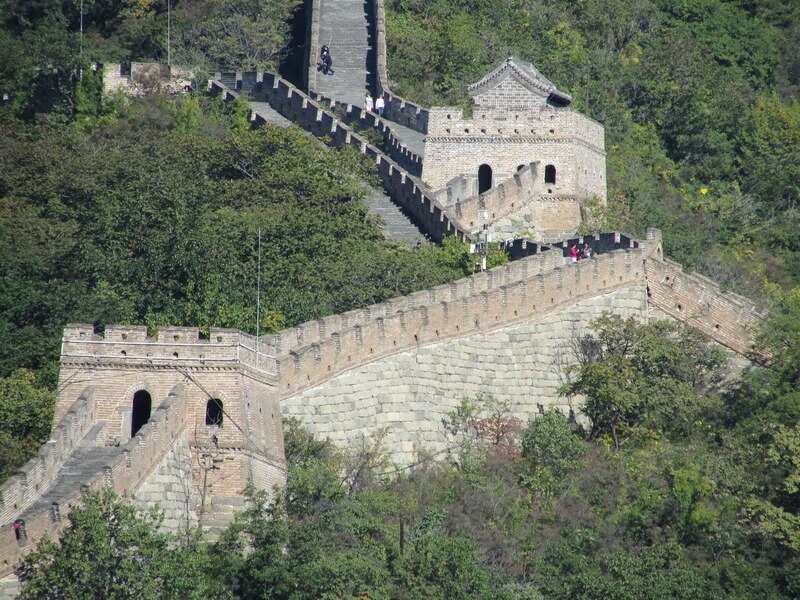 So welcome to China and our new “friends” for three weeks, travellers who like us, have booked “Essential China”, through Canadian Tour Operator G Adventures. 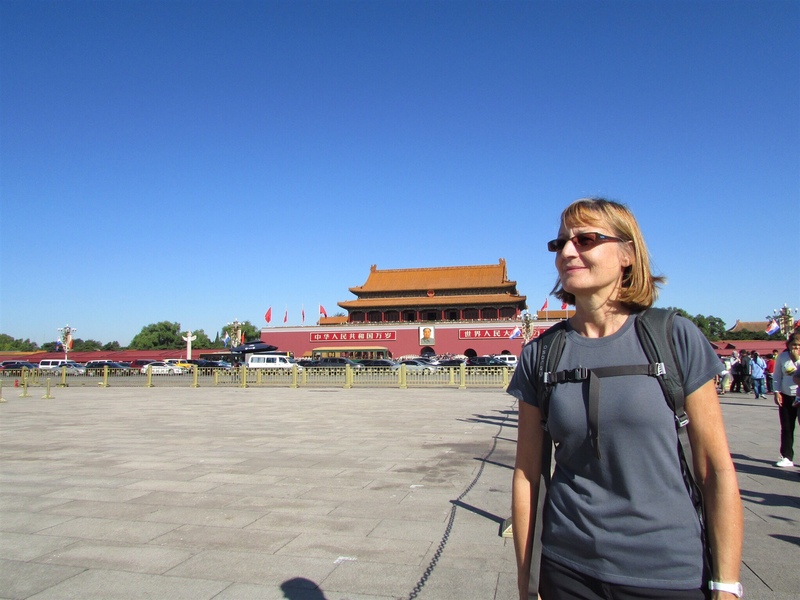 We’d arrived early in Beijing from Nepal and so had three days to explore the city and get to know it a little, before the tour started. 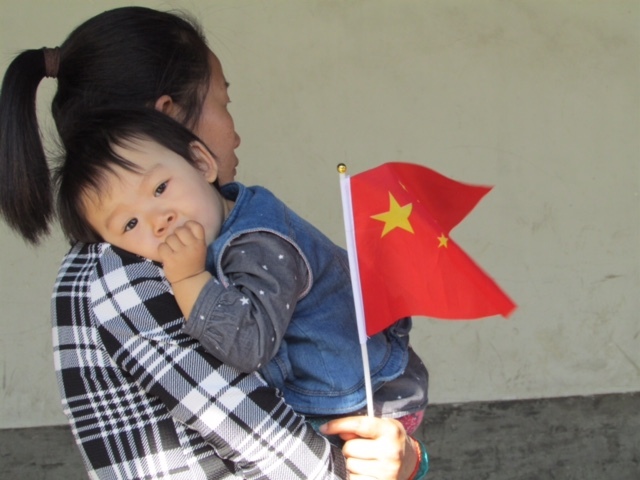 But on the afternoon prior to the “Welcome Meeting” at 6.00pm we both at the same time said “wonder what the others will be like….” We did not have long to wait as people soon started to gather in the Lobby of the Chongwenmen Hotel, everyone eyeing up everyone else. First to rock up was a six foot, six inch Canadian giant. “Hi” he said. “My names Court just like a basketball court”, he smiled and promptly got in a bone crunching handshake, before I had chance to do the same. He’s a salesman I thought to myself and sure enough he was. A Director of a Real Estate Agency from Vancouver, complete with white socks. A nice bloke, you could see straight away – full of wise cracks and married to Linda, an equally lovely person who at 4ft 10” was nearly two feet smaller. For those of you who know Alastair and Sheilagh Black, there are many similarities in terms of stature. 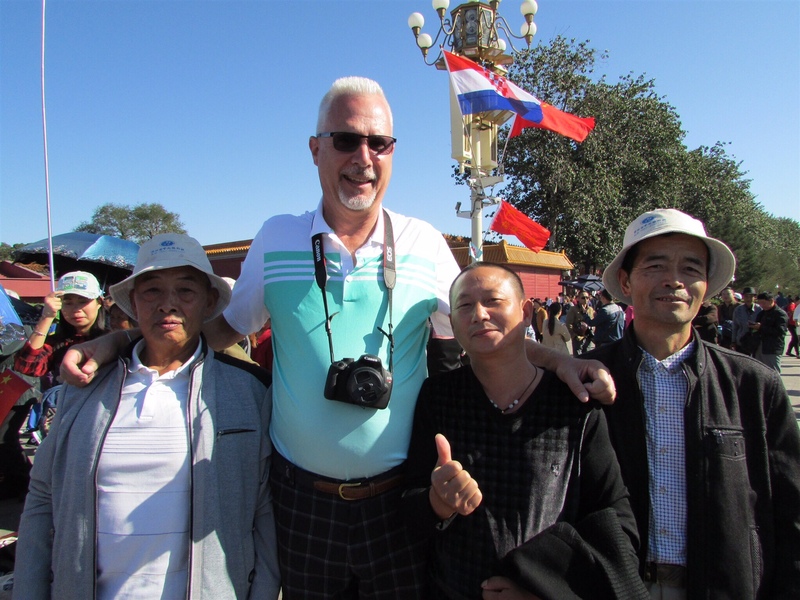 We later had some great laughs with Court around Tiananmen Square when Chinese men wanted photos next to the two giants…. Yes I am a giant too, and not just around my waist. Next morning, bright and early at 0715 we all assembled in the hotel foyer for our first trip to the Great Wall of China, at a place called Mutianyu. A 17 seater coach pulled up outside the hotel and we all scrambled on, me and Sarah like “naughty school children” on the back seat, with Jan (58) a fun, former school teacher, complete with purple hair and a nose ring. Widowed for 8 years, Jan we discovered came from the Wirral and was clearly one of those people up for anything. 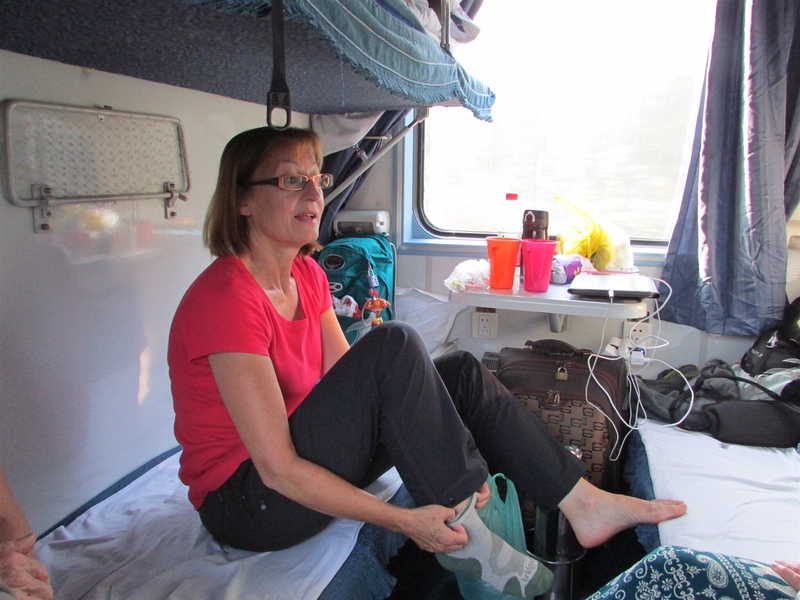 She must have been, having shared a sleeping compartment with five Mongolian men for three days on the Trans-Siberian. More about Jan in a minute! We had a wonderful five mile walk, but quickly broke ranks with the rest of the group as the Bailey’s, lead by Sarah, quickly decided we could walk to 15 different Towers, the rest were left trailing in our wake. 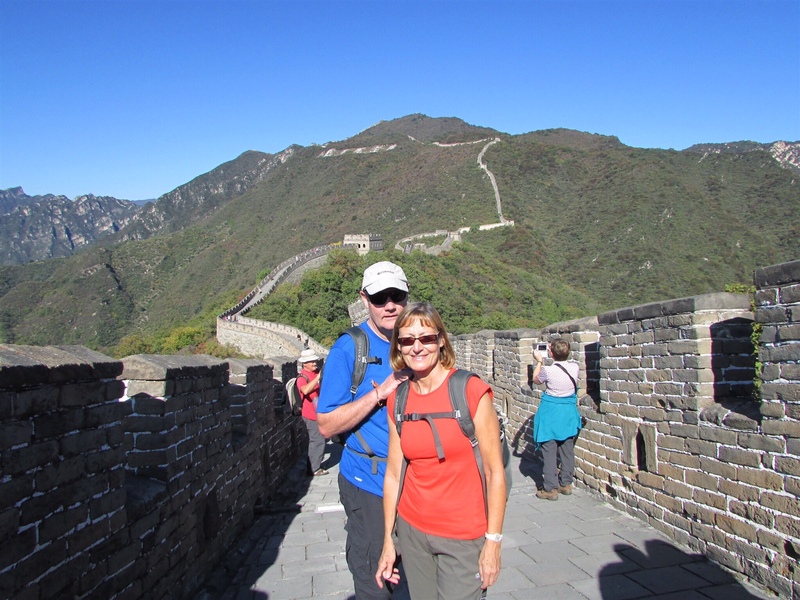 The Wall is truly Great – another tick on the bucket list. After a group lunch in a superb restaurant which produced the bestest Peking Duck we have ever had, it was time for a little nap, in preparation for a big night out, for what was described by one of our party as “disgusting eating”. 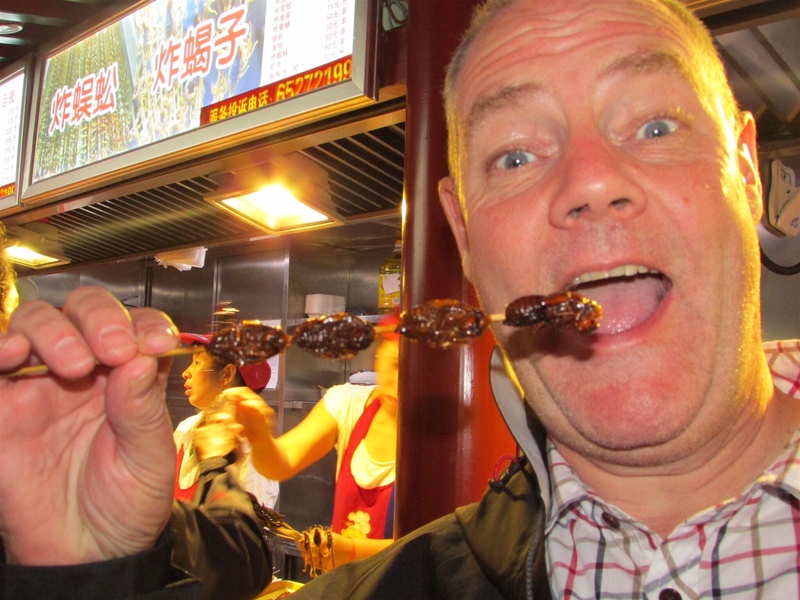 The group, made its way on busses and the metro to an area of Beijing where anything quite literally goes when it comes to eating. The pungent smell of sewage, sweet noodles and animal offal wafted down a small brightly lit street, neon signs and red lanterns everywhere. Suddenly we came across scorpions still wiggling on skewers, large crickets/grasshoppers that looked like something out of “I’m a celebrity get me out of here” and some huge beetle things which resembled a cross between a pupa and a cockroach. Big Mouth Bailey, mentioned how he had been given a list of “things to eat” by his supposed friends – see pre tour blog for details – and so that was it. I was first up to eat a scorpion, the cricket and then the “beetle”. I was joined by Jan and Linda the Aussie who were also game for a laugh. We each bought a round of critters. 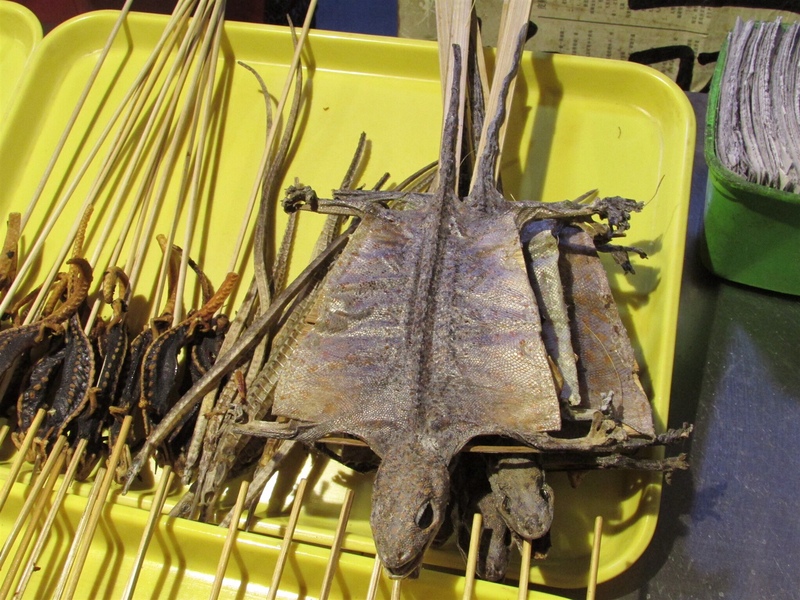 A skewer of four scorpions cost around a £1. Crunch! 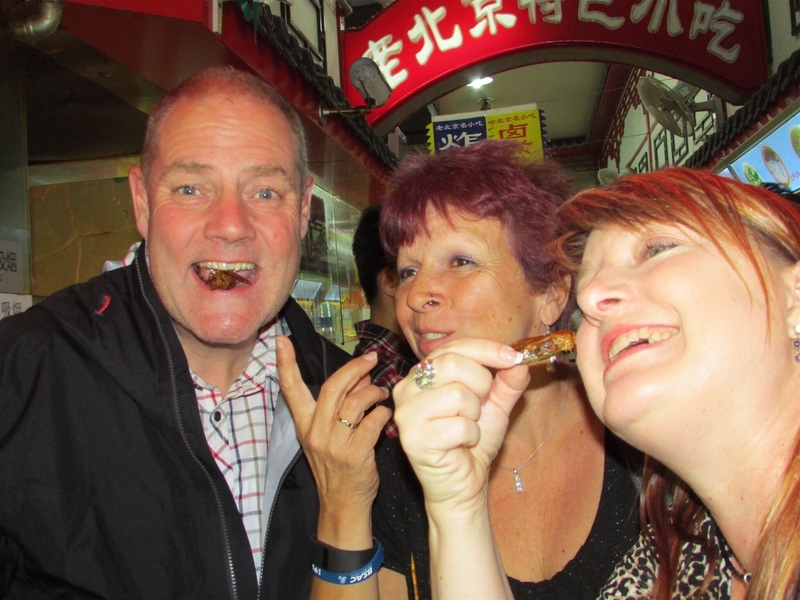 I went for it, the scorpion going down the inside of my throat, lightly toasted and with a bit of chicken flavour. One nil! The others then had a go and we made our way along the different stalls. However, I drew the line on the lizard, star fish and sea horses as I did not want to be running to the open sewer, sorry toilet on board the 17 hour overnight train from Beijing to Shanghai. So no ill effects, which was just as well as we made our way to the Railway station. As for what happened next, well some things just have to stay on tour. 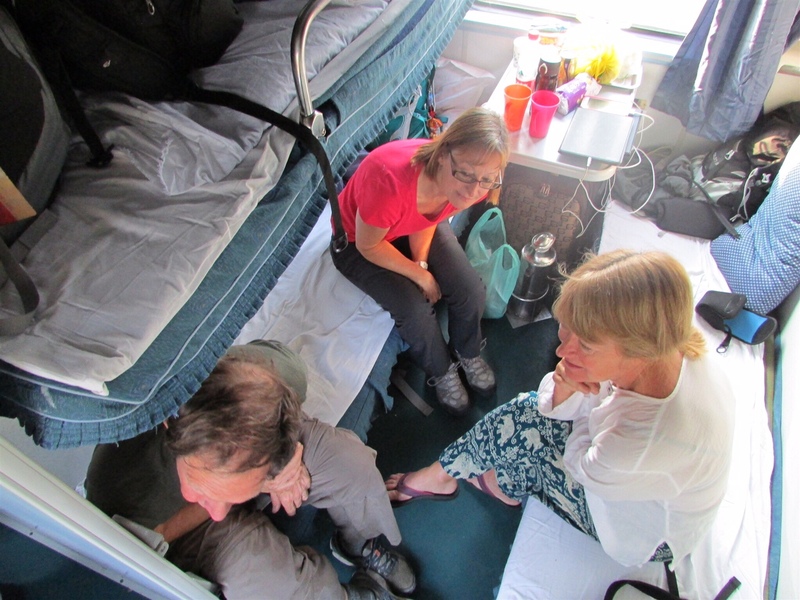 Suffice to say we had a brilliant journey in a six berth sleeper carriage, with Don and Theresa (two mid 60 year olds from Canada) and Mr Wong and Leon, two Chinese nationals. The fire water flowed that’s all you need to know..
Yep, we are very lucky. A good group. Only two Alpha males and no cliques, everyone talking, sharing and getting on…. We’re in Shanghai now, a small place of just 20 million inhabitants. Our thanks again to Russ Baker for posting this and for uploading the graphics, via Skype as we cannot transfer files any other way. Very impressed with the ‘adventurous’ eating. I used to think squashed fly buscuits were exotic! Fantastic travelog, there’s a book in the offing I think, Mr Michael Palin calling. Can’t believe have fresh you both still look after all this travelling, I’m more worn out looking at my PC. Keep up the great posts, always interesting, superbly written and making me feel like travels myself. Hi. Love the blogs. You seem to be enjoying yourself Everything is fine here! So so jealous of the entire trip except for the little nibbles. I would take pork scratching over the crunchy scorpions anytime. Well done for getting in the spirit.